Can INQ take on the BlackBerry range with a budget handset? 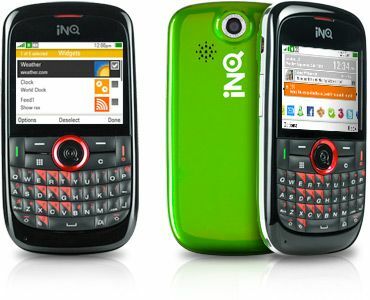 Although designed by a relatively nascent company, the INQ Chat 3G has a good hardware line up and a decent sub-£100 price tag, making it a really intriguing prospect. The fact it's got a full QWERTY keypad, native Twitter support for the homepage, the now regulation INQ Facebook/Skype/MSN Chat integration on top of an app store bodes well - but can all that technology be crammed into a budget handset sensibly? When picking up the INQ Chat 3G, the first thing that strikes you is how light it is - the phone is basically all plastic and rubber, but the width of it in the hand means it doesn't feel too cheap, although it certainly doesn't have the build quality of the BlackBerry range. The front of the phone is dominated by the QWERTY keyboard with the large circular D-Pad encasing the enter button, with the menu, clear and softkeys alongside. The back of the phone houses the cool interchangeable covers, which hark back to more fun days when everyone had the Nokia 3310 and had their own cover in their own style. Admittedly it was 90 per cent England flags... but hey, we're all about choice here. The side of the phone also packs the carousel key - this brings the basic functions of the phone up, like Skype, Facebook and so on - we found ourselves hitting this accidentally far too often, meaning we needed to shift the phone in the hand to use it effectively. The phones uses a miniUSB cable, like the rest of the INQ/Skypephone range, which means that it won't be frontwards compatible when the inevitable change to microUSB happens in a few years time - but we doubt many people buying this will care too much about that. The phone basically sits nicely in the hand, although the QWERTY keyboard does react better to two-handed action compared to being able to flick through it one-handed as you might on a slimmer candybar device. The 2.4-inch screen is good enough for the task as well, coming in at QVGA resolution. It's not going to be amazing for video or anything like that, but it's wide enough to see all your tweets and the like on with ease.